The information presented on this page was originally released on February 14, 2017. It may not be outdated, but please search our site for more current information. If you plan to quote or reference this information in a publication, please check with the Extension specialist or author before proceeding. STARKVILLE, Miss. -- Mississippi fruit growers need look no further than their smartphones or laptops when searching for a second opinion on chill hour accumulation. 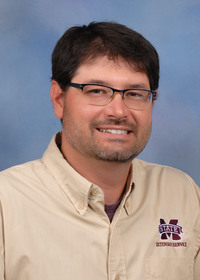 The Mississippi State University Extension Service has launched Chill Hours, an app that helps growers assess growing conditions that affect plant physiology and prepare for the upcoming growing season. Extension fruit crops specialist Eric Stafne and software architect Kelli Alexander developed the app to calculate the approximate number of chill hours. Many fruit plants require chilling to break dormancy and fruit normally in the spring. Growers enter their location by zip code or by clicking on a point on a state map and then enter desired start and end dates. App users can also access a precalculated chill hours calculator by tapping on a flag on one of 15 locations across the state. A chill hour is each hour the plant is exposed to temperatures below 45 degrees. Some fruit plants, such as apples and cherries, require a lot of chill hours, while others, such as blueberries, grapes and peaches, need few or none. The app provides calculations of two different models. One is the common model typically used for blueberries, and the other is a more conservative model. Both can be used for any fruit crop. The free app is accessible through app stores on iPhone and Android devices and at https://webapps.msucares.com/chill_hours/. Email Alexander at kelli.alexander@msstate.edu for technical support and Stafne at eric.stafne@msstate.edu with any questions or feedback.